Yes, Trump can fire Mueller. But a normal president would know not to try it. The news that President Donald Trump ordered the firing of Special Counsel Robert Mueller last June reminds us that this president has not lost his capacity to stun. Trump, as his defenders are already pointing out, does have the raw power to fire Mueller. But that is the least important of the questions now. Instead, we should focus on what this revelation means for the future of the rule of law in America and the Trump administration. Only one previous president attempted to remove a special prosecutor. And things didn’t work out too well for Richard Nixon. Mueller is appointed under special counsel regulations that I had the privilege of drafting almost two decades ago. The idea was to replace the unaccountable “independent counsel” system — which had allowed Ken Starr (Whitewater/Monica Lewinsky) and Laurence Walsh (Iran-Contra) to operate free of ordinary checks and balances — with something more calibrated. There was wide bipartisan consensus that law enforcement investigations ultimately had to be overseen by the president under Article II of the Constitution. What this meant was that there was no way to totally insulate a special counsel from being removed by a president. Yes, the president might first have to order the regulations rescinded or demand that the Justice Department fire the prosecutor, but one way or another, he’d have the raw power to fire even a counsel investigating his own actions. But because of that constitutional reality, the Justice Department, working with Congress, devised a mechanism to try to protect the special counsel in a different way. The idea was sunlight. The attorney general (or the acting one, if the attorney general is recused, as Jeff Sessions is in Mueller’s case) is to supervise the special counsel. To block a corrupt attorney general from interfering with a special counsel, we required any interference to be reported to Congress — and not just to the majority party, but the minority one as well. We particularly feared the “death by a thousand cuts” strategy, whereby a president or his attorney general would take the subtle approach of starving a prosecutor of resources or permissions. Those denials would fly under the radar, and no one denial would necessarily be significant, but collectively they would amount to massive interference. We therefore forced the attorney general’s hand: The regulations say that if he is going to interfere with a special counsel, it must be reported to Congress. Which means last week’s report reveals cause for optimism about the regulations. Because Trump couldn’t subtly undermine Mueller or order his underlings to do that without it being reported to Congress, he had to resort to the bazooka. And while he does have the raw legal power to use the bazooka, it is atrocious judgment. (To use a not-so-hypothetical hypothetical: He has the raw legal power to launch a nuclear first strike, too, but that doesn’t make it wise.) Trump must understand that on some level. After all, he deliberately hid his botched attempt to fire Mueller for seven months and then said two months later (last August) that he hadn’t “given it any thought.” Meanwhile, his lawyer John Dowd that month said that firing Mueller has “never been on the table, never” and that “it’s a manifestation of the media.” Adviser Kellyanne Conway said Trump “has not discussed firing Bob Mueller.” Someone’s pants — actually, many pants — are on fire. But the reports also suggest reason for alarm. At this moment, many wish for legal restrictions in the special counsel regulations that would block Trump from firing Mueller. But rules can do only so much; institutions are often what matters. As James Madison said, “a mere demarcation on parchment of the constitutional limits” is never enough. Our system instead depends on two weapons in We the People’s arsenal: separation of powers and the election of individuals with character and judgment. Right now, both are lacking. Congress has proved itself incapable of investigating the president and, as the sideshow this week with House Intelligence Committee Chairman Devin Nunes, R-California, shows, far more interested in throwing up chaff. 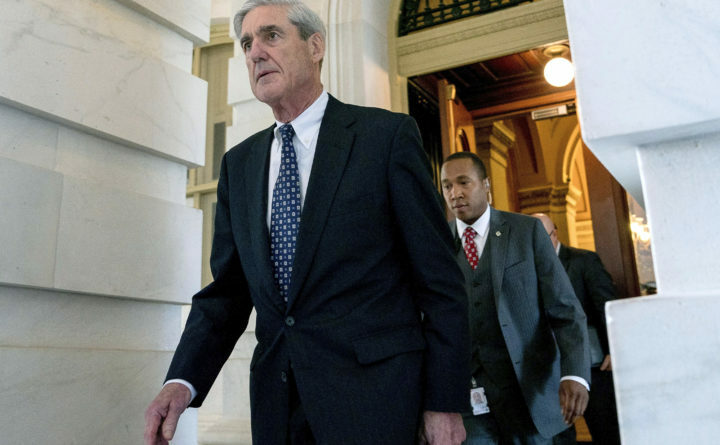 Without a credible congressional investigation (which ordinarily would be wide-ranging, not just the criminal-focused one Mueller is overseeing), it is hard to get to the bottom of complex matters such as Trump’s potential ties to Russia. The president, for his part, has shown an insouciance toward the rule of law unparalleled by any of his predecessors since Watergate. His trumped-up attacks on Mueller’s ethics to justify his firing do not pass the laugh test. They are of a piece with everything else this president does when it comes to the law: manipulate and belittle it. Whether it is “so-called judges” or attacking the career men and women of the FBI, he is Nixonian in temperament and character. Nixon ultimately was forced out of office with impeachment proceedings pending against him in Congress. But the fear here is that today’s Congress is simply incapable of doing its job — even when it comes to simply investigating what the president and those around him have done. The devil’s cocktail is now upon us: a feckless Congress and a president who lacks character and judgment. It is enough to test the resiliency of our constitutional system. Neal Katyal, former acting solicitor general of the United States, is a partner at Hogan Lovells and the Saunders professor of national security law at Georgetown University.